We will meet at Sotheby’s at 6pm. Mary Jo Otsea, who joined Sotheby’s in 1983, is a Senior Consultant and previously Worldwide Director of the Rugs & Carpets Department. In this capacity, she is responsible for securing rugs and carpets to be offered at auction at Sotheby’s. During her tenure, she sold the Clark Sickle-leaf ‘vase’ carpet from the collection of the Corcoran Gallery of Art for $33,765,000, the world record price for a carpet sold at auction. This carpet also set the world auction record for an Islamic Work of Art. The June 5, 2013 auction of Carpets from the Corcoran Gallery of Art achieved $43,764,750, the highest of any carpet auction and a total of over four times the high estimates. In March 2009, she oversaw the $5.5 million sale of The Pearl Carpet of Baroda and a Safavid figural silk velvet panel from 17th century Persia for $3.4 million in Doha, Qatar. Other career highlights include the highly successful sale of Carpets from the Estate of Vojtech Blau in December 2006, which doubled its estimates bringing a total of nearly $5 million. 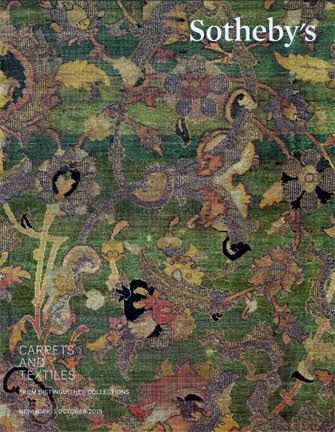 In the fall of 2005, a Safavid carpet from the Collection of Lily and Edmond J. Safra sold for $2 million. A graduate of the University of Oregon, Ms. Otsea spent a year studying in France and is fluent in French. She has served on the judging panels for the International Carpet and a Textile fair held in London and is a member of the Board of Trustees of the Textile Museum in Washington, D.C. Originally from Los Angeles, Ms. Otsea grew up in Geneva, Switzerland.